Protect your lovely kids or pets from danger with our 18 panels baby playpen when you are busy with cooking, reading or doing household jobs. The baby gate features 16 small panels, 1 door panel, and 1 big game panel, making it easier to arrange in various shapes and assemble without any tools. 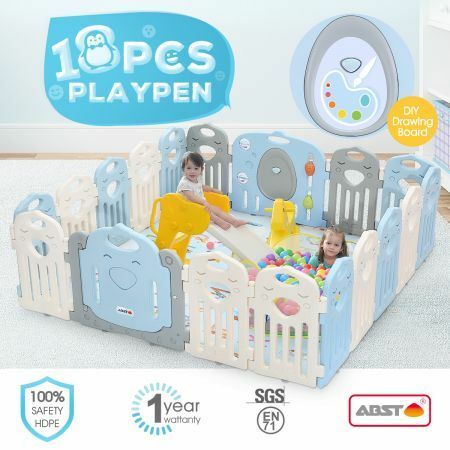 Crafted from 100% pure and eco-friendly PE material, the play pen is non-toxic and secure for children ranging from six months to three years old with proper parental guidance. The safety gate equipped with a lock on the outward side, which guarantees your baby safety. Coming with suction feet, the toddler gate will stick to tiled or glossy areas perfectly. Place the kid's playpen indoor or outdoor to create a recreational and exploratory space for your child. I needed something to keep my 9 month old contained while I was busy doing housework now that shes mobile and I couldnt be more happy with this item. Strong colorful and a great size.